More than 50 years ago, Christine Schrammek made her big break-through with this promise. The development of her GREEN PEEL® Herbal Peeling Treatment helped women suffering from impure or damaged skin to have clear, clean skin again. The basis is a mixture of eight selected herbs containing enzymes, minerals and vitamins, which are massaged into the skin. The original GREEN PEEL® Herbal Peeling Treatment is an all natural peeling treatment with a worldwide proven track record for more than 50 years. It is offered only by certified aestheticians as a treatment in cosmetic salons and accompanied by several home care products such as the original Blemish Balm. Varying amounts of the herbal plant mixtures allows the GREEN PEEL® Herbal Peeling Treatment to be adapted to individual skin conditions and the personal treatment goals. This is the "classic" among the GREEN PEEL® peeling treatments. After a thorough evaluation, the Herbal Peeling mixture is intensively massaged into the skin. This activates the peeling process. The full effect takes two to five days. 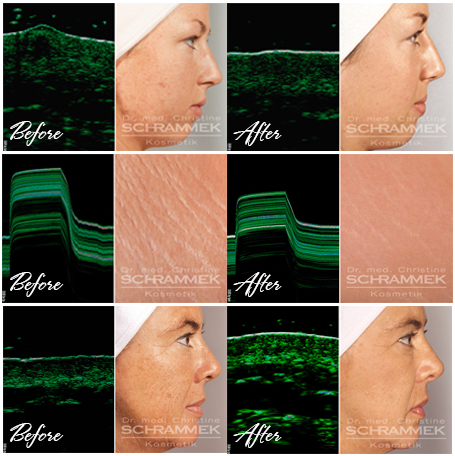 During this time, the skincare must be continued at home with special Dr. Schrammek skincare products. To conclude the classic peeling treatment, the aesthetician performs a beauty finishing treatment after five days and nourishes the now particularly receptive skin with valuable ingredients. Depending on the underlying skin problem or disturbance, several treatments may be necessary. This highly effective curative treatment method improves circulation in pale sun-damaged skin, also helps to correct thick and callused skin, diminish first lines and wrinkles. Additionally this treatment can be used to support purging the body of free radicals and for treating hyper-pigmentation. You will see immediate results after your first treatment. However, it works ideally as repeated, intensive treatment. You will achieve maximum benefits with a series of four to five treatments, spaced three to four weeks apart. Five days prior to a Green Peel Energy treatment, stop using acne medications, such as Retin-A and Accutane, and acid peels. After the peel treatment, depending on skin conditions, there will be slight to moderate redness and possibly a slight tingling sensations. Due to activated circulation, there can also be some flakiness over the next few days. Intensive exposure to the sun should be avoided. This method stimulates and revitalizes skin rather than peeling it. Circulation is stimulated, pores open and skin is now able to optimally absorb the ingredients of the subsequent skin care. Complexion appears brighter and fresher. Up-to-date studies prove the success of the GREEN PEEL® herbal peeling.